The close relationship between Wordsworth’s 1804 ‘I wandered lonely as a cloud’ (commonly called ‘Daffodils’) and his 1802 ‘The Barberry-Tree’ has been largely overlooked. The principal reason for this is that the 113 lines of ‘The Barberry-Tree’ were not discovered until 1964 and the poem was only accepted as part of the Wordsworth corpus after Jonathan Wordsworth, an Oxford academic and descendant of William, illustrated its parallels with ‘Daffodils’ in 1966. In 1986, he asserted again that the Barberry poem ‘screams out Wordsworth’. Indeed, the description of the blossoms of ‘The Barberry-Tree’ which the speaker recollects that he saw when, he says, ‘I wander’d forth’ (l. 3) and which ‘in hill or vale’ (l. 9) ‘laugh’d and danc’d upon the gale’ (l. 11) is clearly echoed in Wordsworth’s 1804 ‘I wandered lonely as a cloud … o’er vales and hills’, all at once meeting ‘dancing Daffodils’ in ‘laughing company’. Notably, the daffodils became ‘golden’ (like the Barberry’s ‘golden blossoms’, l. 26) as well as ‘dancing’ in the 1815 version. ‘The Barberry-Tree’ contains seemingly frivolous lines, as do ‘The Idiot Boy’ and ‘The Tinker’ (written on 27 April 1802). It reads like a self-parody – a bumbling recollection, addressed to someone called Jacob Jones, telling of how the speaker ‘wander’d forth’ one breezy, spring evening and came across the sweet sight of a flowering Barberry tree which seemed to be laughing and dancing in the breeze. The speaker wonders whether the blossoms, leaves and branches and even the moving, piping air around it might experience living pleasures, as we humans do. Filled with this joyful experience, the speaker falls into a trance, until stirred from his reverie by the church chimes when he realises he has missed an appointment to share nuts and cider with Peter Grimes. He moves on; but what he has experienced seems to go along with him as part of his very being, his inner self. He tells Jacob Jones how to share the same experience, and jokes with him that if he should go when it is dark and windless he will not enjoy the same sights and sounds; but if he goes when it is light and breezy, he will learn “a lore… never learned before; The manly strain of natural poesy”. The first known text of ‘The Barberry-Tree’ was found in a letter of 1807 from Charles Abraham Elton to his sister Julia Hallam containing his transcript of what he called ‘a curiosity’, an ‘M:S: of Mr. Wordsworth never publish’d’. It is now held among the Hallam papers at Christ Church, Oxford. A similar text can be read online, wrongly attributed to Coleridge. Nine days after her journal entry about daffodils, Dorothy noted for 24 April, ‘A very wet day. William called me out to see a waterfall behind the Barberry tree’; and on 28 May she wrote ‘barberries are in beauty’. The fact that she called the barberry a ’tree’ rather than a shrub or bush, as it was generally known, helps to validate ‘The Barberry-Tree’ as a Wordsworth composition. 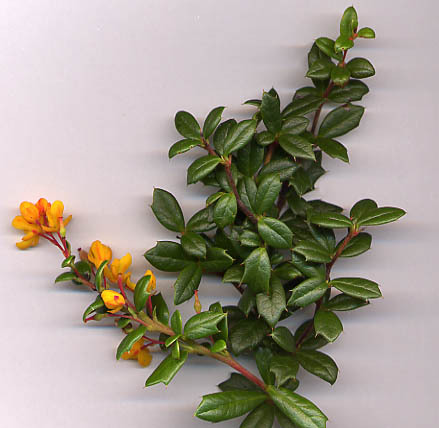 The plant was berberis vulgaris, as she probably noted from An arrangement of British Plants: According to the latest Improvements of the Linnaean System, in Four Volumes, by William Withering, which William had acquired in early 1801. Mr. Southey, Mr. Clayfield, Mr. Tobin, and others, inhaled the new air. One, it made dance, another laugh, while a third, in his state of excitement, being pugnaciously inclined, very uncourteously, struck Mr. Davy rather violently with his fist … (my bolding). Likewise, the daffodils and the barberry leaves and blossoms laughed and danced in stimulating air. It would appear that the effects of laughing gas, like those of Coleridge’s opium, were already known at Dove Cottage in 1802. … Jacob, you don’t go by night. And yellow, may not well be seen. The piping leaves will not be heard. There is a still a barberry the garden of Dove Cottage. It would appear from Dorothy’s note of 24 April 1802 that she may have feared that their own plant was in danger of being washed away. Dorothy’s concern would have been all the greater because the common barberry was both an attractive and useful plant, bearing yellow blossoms in late May and red berry fruit in the autumn. The berries were used in jams, jellies, sauces, sweets, garnishing and flavouring. An infusion of the bark in white wine made a purgative. The roots or bark, boiled in an appropriate solution, produced an excellent yellow dye for wool, linen and leather. 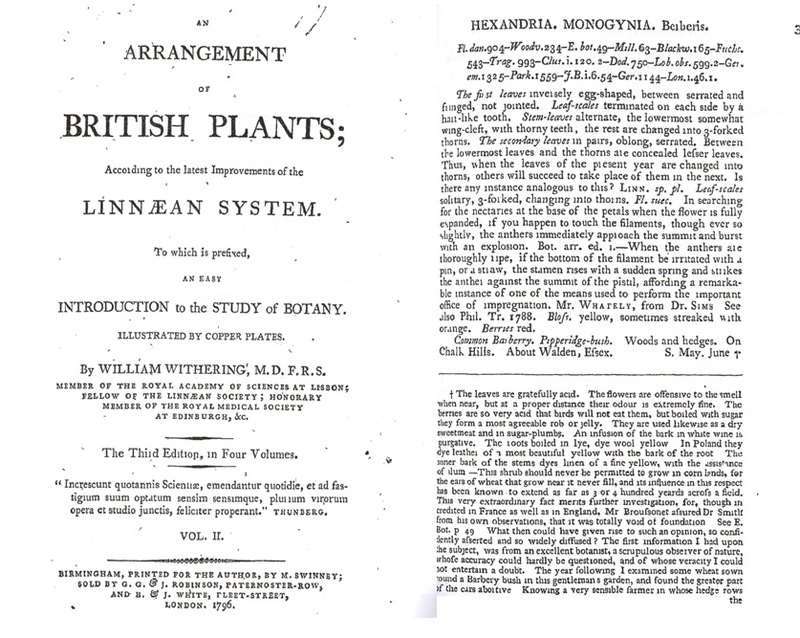 William Withering gave a detailed description of the plant and its characteristics, noting how the stamens of its flowers would give a ‘sudden spring’ when touched, either by an insect or an implement like a pin, calling this ‘a remarkable instance of one of the means used to perform the important office of impregnation’. However, the barberry had its enemies. By 1800, farmers had already found that its proximity to a wheat field damaged the crop. The reason for this was not then understood, but it was generally thought to be due to the odour it emitted. Withering noted this phenomenon, and speculated (correctly) that the damage was caused by fungus. It still grows freely in parts of Europe where it still has uses in cooking and herbal medicine. Its use in Chinese medicine goes back thousands of years. In Italy the barberry is known as ‘Holy Thorn’, because it is thought to have formed part of the Crown of Thorns. The relationship between ‘Daffodils’ and ‘The Barberry-Tree’ casts an interesting light on the interests and concerns of those at Dove Cottage in the spring of 1802. William, Dorothy and Coleridge were in a literary, intellectual and emotional ferment. Lyrical Ballads was entering a third edition, and the loves and lives of the ‘Gang’ (as Coleridge called them in late April 1802) were getting more complicated. William was planning to marry Mary Hutchinson later in the year, with inevitable consequences for his relationship with Dorothy. The married Coleridge was addicted to opium and had fallen in love with Mary’s sister, Sara. William and Dorothy were planning to visit France to settle maintenance for his love-child by Annette Vallon. All this mental ferment is reflected in the excited, sometimes silly but entertaining mood and questioning of Coleridge’s ‘The Full Moon … in A Mad Passion’ and of its close contemporary, ‘The Barberry-Tree’ – ‘I do not know, I cannot tell!’ (l. 44). The latter emerges as a curious, seriously jocular poem of lasting significance. Fred Blick is an independent scholar from a multi-disciplinary background. He has published a number of essays over the past twenty years; not only “Wordsworth’s Dark Joke in ‘The Barberry-Tree’” in “Romanticism” journal in October 2014, but also innovative essays in peer-reviewed academic journals worldwide on the subjects of the Sonnets of William Shakespeare and of Edmund Spenser.